We are reversing our negative stance on SQ (see note of Nov 7th titled “A Wing and a Square”) to positive with a price target of $15 representing a market cap of ~$5bn or 6x expected 2017 revenue net of pass-through transaction costs. Given improving capabilities in data-analytics for merchant customers, we believe SQ will be able to continue to march up-market from its legacy business serving micro-merchants (defined as having annualized global payment volume or GPV of <$125k) to larger merchants which are structurally more attractive for core payments processing and offer greater potential for cross-selling commerce-enablement solutions, such as business management software and financing, and is attractive as an acquisition target for a traditional acquiring-processor or for MasterCard. The reason for the change in view is that SQ is successfully marching up-market from its legacy business serving micro-merchants, which is structurally unattractive for payments processing because of high turnover and fraud, to larger merchants while holding pricing. Specifically, these larger merchants contributed 39% of GPV in 2016Q1 versus 34% in 2015Q1 while core (i.e. excluding Starbucks) transaction revenues were 2.95% of GPV (after adjusting for promotional credits on chip and EMV readers) vs. a “take rate” of 2.97% in 2015Q1. This mix-shift at stable pricing is improving efficiency in sales-and-marketing and in transaction-and-advance losses (see Chart) because of the lower churn and fraud rates of larger merchants. We are reversing our negative thesis on SQ to positive with a $15 price-target (representing a market cap of ~$5bn or 6x estimated net revenue for 2017). We believe the company is developing merchant-facing data-analytics capabilities that will either enable it to continue to profitably march up-market from its core segment of micro-merchants (for whom payments processing is unprofitable because of high turnover and fraud) to serve larger, more profitable customers or make it attractive as an acquisition to a legacy acquiring-processor or to MasterCard. We have had a negative view on SQ since its IPO on Nov 19th, 2015 (see our note titled “A Wing and a Square” of Nov 7th) on the grounds that its core business of payments processing for micro-merchants was structurally unattractive (because of high turnover and fraud) and that the company’s two-pronged strategy for addressing this would not generate the expected margins. The two prongs were: (i) to march up-market to serve larger merchants where our concern was that this would require meaningful discounting of the SQ’s standard processing fee (of 2.75% of transaction amount for card-present transactions along with transactions through Square Invoice and the Square Online Store and 3.5% of transaction amount plus 15 cents/transaction for other card-not-present transactions); and (ii) to boost revenue by selling commerce-enablement services including POS hardware, business-management and marketing software (Chart 1), and financing where our concern was that this would lead to negative surprise on expenses. We are reversing our thesis from negative to positive because we were wrong on the first item as the take-rate (i.e. transaction revenue over gross purchase volume or GPV) has remained stable even as the proportion of gross purchase volume from larger merchants (i.e. merchants with annualized GPV > $125k) has increased to 39% in 2016Q1 from 34% in the year-ago quarter and because the second item is now consensus after the first quarter report on Thursday since when the stock has declined by ~20%. We are buyers here and into any further pressure as a result of lock-up expiry on May 16th which will make ~64mm stock options and warrants newly exercisable against current shares outstanding of ~335mm and a float of ~14mm. The ability of SQ to maintain stable pricing with a GPV mix-shift to larger merchants is important for two reasons. The first reason is that it has allowed core processing to move from breakeven in 2015Q1 to marginally profitable in 2016Q1 (Chart 2). This is because of improved efficiency (as measured in proportion to core transaction revenue) of sales and marketing expense given the higher volumes and lower turnover of larger merchants, and of transaction and advance losses given the lower fraud costs of large merchants. Management has added that customer acquisition costs are competitive for large merchants because the brand effect, where 50% of merchants come “organically” to the platform in the sense of never having been touched by any form of paid marketing, is true for larger as well as smaller merchants. The second reason is that the ability of SQ to hold pricing for larger merchants suggests there is meaningful value in commerce-enablement services including data-analytics. Since November 2013, SQ has offered custom-pricing for larger merchants and been clear in its SEC filings that there is “an inherent trade-off between the size of our sellers [i.e. merchants] and our transaction revenue as a percentage of GPV because we selectively offer custom pricing to large sellers”. Management has clarified that custom price offers to larger merchants “go alongside their willingness and ability to pay for other services as part of our ecosystem … and we look at it holistically as total cost-of-ownership”. For now, it appears that SQ is able to hold the line on its transaction-pricing by offering other services at attractive rates. The above cost-analysis does not include product-development expenses because these support not so much core payments-processing as SQ’s commerce-enablement ecosystem more broadly. CFO Sarah Friar noted that SQ “leaned heavily into that [product development] in 2016Q1 … adding engineering and data-science talent” and being emphatic that “product development will always remain a key focus for Square underscoring what we are at heart which is a technology company”. The numbers bear out her comments: product development costs were 19% of core revenue (including both transaction revenue and commerce-enablement services) in 2016Q1 vs. 17.9% in the year-ago quarter. While it is reassuring that SQ lifted FY2016 guidance for adjusted EBITDA to $8-14mm and raised the possibility of breakeven as early as 2016Q2, we believe investment in data-analytics capabilities (e.g. 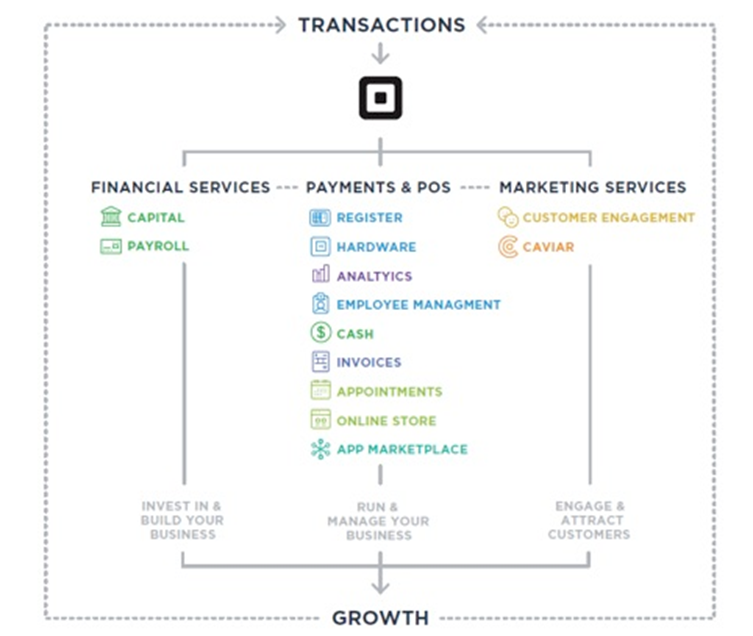 to support targeted marketing by its merchant sellers) is a strategic imperative to allow the firm to continue growth at stable pricing for larger merchants and an important element of its attractiveness as an acquisition target if pricing pressures in the larger-merchant segment become too intense so that SQ needs to access a more scaled platform for core processing. With SQ, as with PYPL until the recent quarter, there is a lack of disclosure on net loss ratios for cash advances and loans to merchant-sellers. While the majority of these loans are sold to third-parties so that SQ is not exposed to the associated credit risk, that still leaves net receivables of $48bn on the books at end-2016Q1 representing ~10% of stockholder’s equity and growing >30% year-on-year. The firm commented in the last annual report that credit losses associated with merchant cash advances had been “immaterial” since the launch of Square Capital in May 2014 but there was nonetheless a provision of $6.2mm in 2015 for uncollectible balances representing 17% of the year-end net receivable amount of $36.4mm; for 2016Q1, this provision improved meaningfully to a mere $75k vs. $2.5mm in the year-ago. Regardless, we cannot reconcile the provision disclosures to management commentary on Square Capital that “we are able to keep a very low and consistent default rate … we talked about 4% and the fact that it has been trending a little bit better in Q1 because we believe we are going better and better from a data-science perspective”. The loss-ratio trends are important given not only the loans retained on the balance-sheet but also the need to support Square Capital through finding third-party investors to buy the paper.